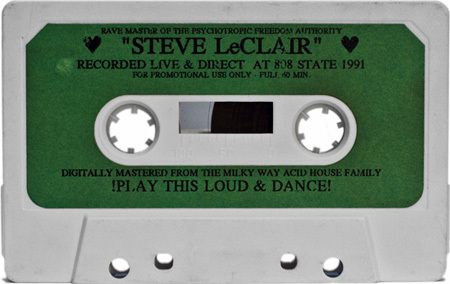 Rave Master of the Psychotropic Freedom Authority, Steve LeClair, recorded live and direct by The Milky Way Acid House Family, at the 808 State rave in 1991. TY for sharing this. I lost this eons ago. 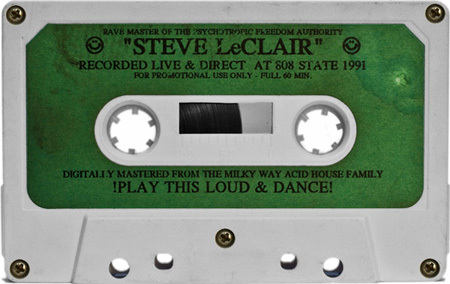 It seems that every underground that I attended in the early 90’s had Steve Leclair, Michael Cook, Jon Williams, Barry Weaver and Mr Kool-Aid on every freakin flyer, great times and so many happy faces and positive vibes all around!!! What the name of the first song on the smile side? the “mission from god” track… who is the artist? that’s the 1…. Thank you JM. Steve is a great guy and a true artist and real talented painter. I was honored to be able to record and master this tape for him at the 808 concert. Mike Paris- AKA Michael Milky- Milky Way Rave Recordings a Untied Nations Underground production from the past. Mr. Mike Paris – thank you for your vision, dedication and many unforgettable contributions to the lost underground dance culture we once knew. Though many have tried to imitate, they never duplicated. Those recording are pieces of underground history that paved the way for many. Another great upload, Josh! Thanks!